Our 2019 Country Basket Program is Now Full ! Last Years customers filled all Available Spots. We appreciate All our Customers. For the 2019 Farming Season We are going to offer A limited number of our Country Baskets delivered on Wednesday or Thursday (depending on route) within 20 miles of our Farm to your door. ( If you are ­outside this area, ask us about a pick up point) Delivery will begin sometime from the first to Middle of May (depending on weather) and run for 12 weeks until around the end of July. This Year we will offer Two Sizes of Country Baskets. Our Large Country Basket will be delivered in a 3/4 Bushel Box and will feed a family of 2-4 people (Approximately). The price of the Large Country Basket Delivered is $30. This Year we are going to offer Several Pay & Vacation Options to fit your Budget. We will Offer A Lump Sum Payment/with Discount paid up front . You may Choose to receive A Country Basket For All 12 Weeks or Skip A week of your Choice for 11 weeks of Delivery. You May also elect to Pay As You Go Each Week But To Reserve Your Space we Require First and Last Deliveries Paid in Advance. Pay As You Go Large Country Basket/Delivered-$30 a Week, with $60 Due at Sign up. Pay As You Go Small Country Basket/Delivered-$25 a Week, With $50 Due at Sign up. With Pay As You Go, We will collect for all other Country Baskets the Day of delivery and we allow one Vacation Week if needed. Please tell us 1 week in advance if possible. We accept Cash, Checks or Money Orders. This is Due By March 7, 2019 on a First Come (first pay) basis. There are only a “Limited Number” available and we expect them to fill up quickly. We will advise when we are full and begin a waiting list. 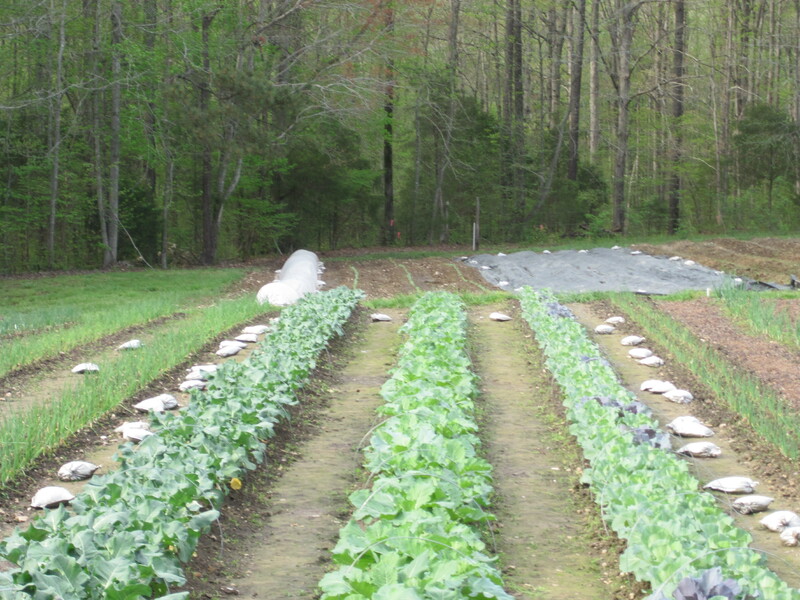 We grow all our vegetables using all Organic Methods. We are not Certified Organic but we grow from Start to Finish with All the “Good Stuff”. No Pesticides, No Herbicides, and No Synthetic Fertilizers. We want you to Enjoy “GOOD” Safe Food like we eat ! Beginning this season because of all the concerns over e coli and Lettuce we have built a new lettuce and greens tunnel. Our lettuce will be grown hydroponically and enclosed inside. We want you to have the very safest food possible. Selling at Several Farmers Markets has introduced us to other Farmers. These People specialize in products that we don’t grow or have available. These fruits and berries are what we buy and use ourselves. This year when available we are working with these folks to provide them in your Country Baskets from time to time. You can expect berries and peaches, (In season) We think you will love these additions. If we have crop failure on a particular vegetable or berry we will fill in from a Like Minded Farmer. “Good” Fresh variety of Vegetables (Pesticide Free) Picked fresh, rinsed and packed in baskets and containers. We then deliver them to your home or business for 12 weeks. Note: Baskets & Containers are property of White Oak Farm. Each week we will pick up the previous weeks baskets & containers to reuse again. Even though we grow in the organic ways and rinse veggies- “It is always recommended to wash Items before consumption.” We highly recommend you leave a Cooler outside each week for your delivery. White Oak Farm gives you Peace of mind that you are getting the freshest, nutritious and local grown produce available. You are also supporting local Agriculture and “We Appreciate It.” Your satisfaction is our utmost concern. mail it back to the address on the form along with the appropriate amount to Reserve your space for our Country Baskets. We Only have A Limited Number of Spaces Available so sign up As Soon As possible. Remember Deadline for Signing up is March 7, 2019 or earlier if all slots are filled. Make Checks or Money Orders Payable to- White Oak Farm. This entry was posted in Uncategorized on February 14, 2019 by Gary. 2015-What A Year – Thank You ! It’s been a long hard year and it’s almost time to start again but we are up for the challenge. We want to Thank each and everyone of you for making this such a successful year for us ! We have had the opportunity to meet new friends and farmers along the way. Plans are already started for the 2016 season as well. Seeds are ordered, we are adding another High tunnel greenhouse this winter along with some upgrades to the packing room. Another walk in cooler should be ready by early spring. Our 2016 Country Basket program will get a new look this year also. You folks have told us what you wanted and we have listened. Without you this would not be possible. Our Basket Program information will come out the first of January with the first two weeks being offered to last years customers. After that it will be opened up to the rest of the community with more slots available this coming year. Remember we grow the Old Fashion way like our grandparents did, bringing you the freshest veggies possible. Planted, picked, washed, packed and delivered by us. So follow our journey for 2016 as we Continue to “Grow Good Food For Good People ” Thank you so much for allowing us to do what we enjoy ! This entry was posted in Uncategorized on December 3, 2015 by Gary. This Thursday, 6/11/15 from 1:30 p.m. – 5:30 at the Montgomery County Farmers Market in Troy we will have Lots of tomatoes, new potatoes, green beans, onions, beets, cucumbers, squash, cabbage, a few blueberries and a little okra. This entry was posted in Uncategorized on June 10, 2015 by Gary. Picking in the rain this afternoon. Heading to the Montgomery Co. Farmers Market Thursday afternoon, 1:30-5:30. Lots of tomatoes, green beans, sweet peas, cucumbers, onions, cabbage and much more. Bring your umbrella and join us. Thanks for your support! This entry was posted in Uncategorized on June 3, 2015 by Gary. Heading out early in the morning to the Stanly County Farmers market- 8 to 12 noon. We will have Tomatoes, radishes, onions, Sweet peas, cabbage, salad mix and squash. Hope to see you at the market ! This entry was posted in Uncategorized on May 29, 2015 by Gary. Heading to the Montgomery Co. Farmers Market Thursday afternoon, 1:30 to 5:30. This week we will have Tomatoes, radishes, onions, Sweet peas, cabbage and more. If you get a chance drop in and see what the vendors have to offer. You will be supporting the community and also local farms. We Always appreciate your support ! This entry was posted in Uncategorized on May 27, 2015 by Gary. The Montgomery County Farmers Market is located in Troy, NC in the down town section. We will be there this week with fresh produce. Just some of the things you will find are- Our salad mix, kale, swiss chard, radishes, collards, onions and anything else that’s ready. New time for the Market. 1:30 to 5:30 in the afternoon. Tomorrow is Senior Day. All Seniors get a 10% discount ! We don’t Card…… I promise ! This entry was posted in Uncategorized on May 13, 2015 by Gary. Another busy week. For the last 3 weeks we have been to the Stanly County Farmers Market, and sold out all 3 times. We are humbled by your support and we Thank You ! We are sad to say we will not be there tomorrow, but should be back soon. Tuesday starts our Country Basket deliveries and truthfully we need warmer weather for our field crops to grow. Again thanks to all our customers for your support! Hope to see you soon. This entry was posted in Uncategorized on May 1, 2015 by Gary. We will NOT be at the Montgomery Market this week. This has got to be one of the coldest springs on record. Even though we have lots planted it’s growing slow. The high tunnel crops are doing real good though. Hopefully we will be back at the market soon. Thanks for your support ! This entry was posted in Uncategorized on April 29, 2015 by Gary. We will be at the Stanly Co. Farmers Market Saturday 8 to 12 noon. Broccoli, asparagus, kale, zucchini, radishes, swiss chard, few cucumbers, lettuce mix, onions and collards. This entry was posted in Uncategorized on April 24, 2015 by Gary. Sheila Menendez on Happy New Year 2014 !